lawmakers have introduced bills that would subject the fundraising arm of the university to the Freedom of Information Act and allow the Auditors of Public Accounts to review the foundation’s finances. Those bills went nowhere. But this year, a dramatically watered-down version of the legislation has been introduced that would require the foundation to release a laundry list of documents – most of which are already public by state or federal law. Perhaps the most significant change involves the disclosure of how many disbursements the foundation makes for various categories of support, including scholarships and endowed professorships and program support – although the university already reports the total amount spent on those categories. A second bill, for which a public hearing is scheduled tomorrow, March 18th, would require the foundation to release information on its financial support for faculty and staff (though the bill’s wording leaves it unclear whether that would require more disclosure than the university already makes). And the legislation would make public the names of people and companies donating to the foundation – unless the donor requests secrecy. If that bill passes, it will be particularly interesting to see how the foundation implements that provision. 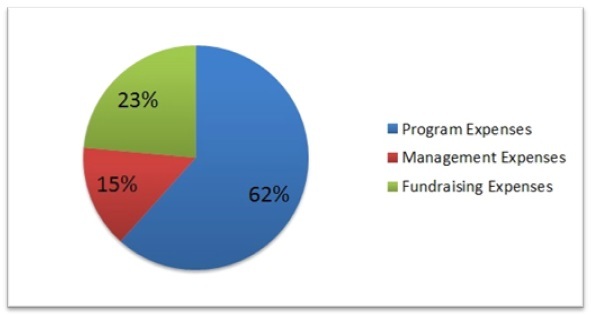 Click here or the chart below to download our full Charity Check report on the University of Connecticut Foundation (which will open as a Word document). 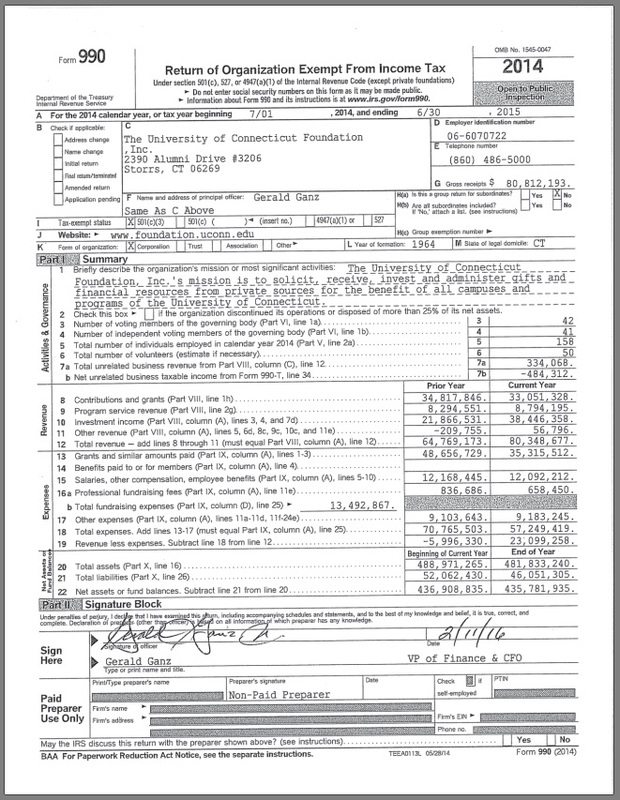 And click the image at bottom to download the foundation’s most recent tax return. The National Football League, the mega-moneyed organization behind this Sunday’s sports extravaganza, is eligible for The Scoop’s Charity Check feature as a bona fide, IRS-approved non-profit organization. It just happens to be one with a $30-million boss. Click the NFL logo below to read our report on the NFL’s latest tax filing, and the “Continue Reading” link to see the actual filing. And click here to view past Charity Checks. They start cropping up in October, and by Thanksgiving, the landscape is awash in white-and-red cardboard boxes beckoning shoppers to drop off gifts for the Marine Toys for Tots program. Last year, nearly 17 million presents ended up in those boxes – a toy donated every half-second somewhere in America – with a combined value of nearly a quarter-billion dollars. Local volunteers collect, warehouse, categorize and distribute the gifts, and the whole operation is supported by the Marine Toys for Tots Foundation, located not far from the Quantico Marine Corps base in Virginia. The foundation, run entirely by ex-Marines, manages a big logistical operation – and pays a few big salaries to match. Click the chart below for our full Charity Check report on the Marine Toys for Tots Foundation. And scroll down for the group’s most recent tax return. Goodwill Industries, a highly rated charity best known for the thousands of thrift shops run by its network of local affiliates, finds itself on the defensive after recent complaints that the group pays disabled workers as little as $1.44 an hour. Goodwill Industries participates in a U.S. Department of Labor program that permits employers to pay physically and mentally disabled workers less than the federal minimum wage of $7.25 per hour. 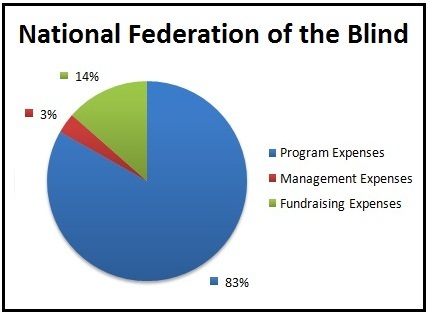 That has drawn ire from the National Federation of the Blind, which supports legislation to phase out the program. Maurer acknowledges that use of the federal program is widespread, but said many nonprofit organizations with disabled workers have transitioned to paying all of their employees the minimum wage or higher. 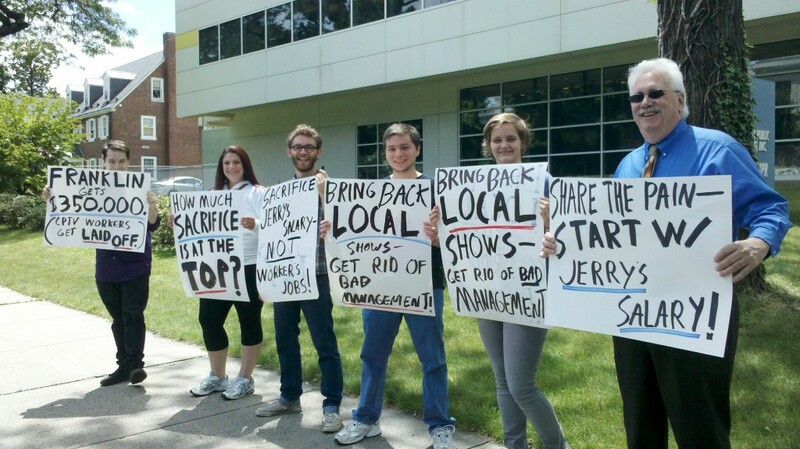 His organization has called for a boycott of Goodwill. Goodwill says about 7,300 of its 105,000 employees are paid under the Department of Labor program, which permits employers to pay “commensurate wages” – essentially the prevailing pay for the job, discounted by the extent to which an employee’s disability affects his or her ability to do the work. The program “enables Goodwill and thousands of other employers to provide opportunities to people with severe disabilities who otherwise might not be part of the workforce,” Goodwill said in a statement. While the two nonprofits duke it out, click on the links below for a look at the finances of each group. Connecticut’s entire Congressional delegation sent a letter this week to the chairman of the Federal Trade Commission, urging the watchdog agency to investigate the Veterans Support Organization, a Rhode Island-based nonprofit that has raised millions of dollars, much of it via camouflage-clad solicitors who stand outside grocery stores and other shops. The unusual letter was in response to complaints by officials with the Veterans of Foreign Wars, who are concerned that VSO is employing solicitors who claim to be volunteers, but are actually paid a commission based on the money they bring in. The senators and House members also expressed alarm at the group’s finances, noting that VSO collected $5.8 million in fiscal year 2010, but spent only $379,000 on grants to veterans and veteran groups. “We urge the FTC to continue to prosecute sham charities and protect the credibility and effectiveness of legitimate nonprofit organizations that really help America’s heroes,” the delegation wrote. Several years ago, the Courant ran a lengthy investigation of veterans charity, noting their inefficiency and identifying those that spent pennies on the dollar — and in some cases, less than a penny on the dollar — for charitable purposes. So how does the Veterans Support Organizations stack up? It’s a complicated question, because the way the charity keeps its books, it counts all of the commissions paid to those solicitors – reportedly up to 30 percent – as part of an “on-the-job training program” for down-on-their-luck veterans and others. As a result, the group in fiscal year 2010 claimed to spend not one penny on fundraising expenses, and attributed 70 percent of its $5.7 million in spending to that job-training program, which was also the source of virtually all of its fundraising. That purported jobs program has come under fire not only for allegations that solicitors falsely claim they are volunteers, but also because some have given the false impression they are military veterans. The nonprofit in fiscal 2010 spent more than $70,000 on uniforms — which it also classified as a charitable program expense — and in recent years solicitors have generally been dressed in fatigues, camouflage or khakis when collecting money. The Veterans Support Organization has also run afoul of charity laws in Tennessee, leading to a negotiated $20,000 settlement. And consumer reporter Arnold Diaz sent an undercover producer to interview solicitors last year, and caught them making false claims about how the group spends its money. Despite the controversies, it’s a lucrative operation for founder Richard Van Houten. In fiscal year 2009, he collected $120,000 as chief executive officer. The following year, donations more than doubled – and so did his salary, reaching $255,000. For more details on the group’s finances, click the image below. One hundred years ago today, Juliette “Daisy” Gordon Low brought together 18 girls in Savannah, Ga., and the Girl Scouts was born. In the century since, tens of millions of girls have passed through scouting programs, and billions of cookies have traded hands. More than 100 local chapters now serve 2.3 million girls, along with 880,000 adult volunteers. The infrastructure behind that work is large as well, with at least 17 local chapters – Connecticut’s included – running budgets topping $10 million a year. Girl Scouts of the USA, the umbrella organization, raises and spends $80 million a year, with a top official earning more than half a million dollars a year. 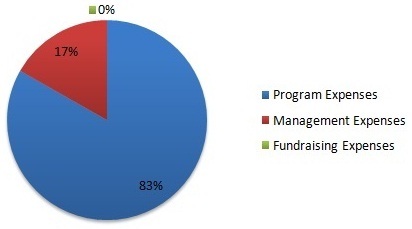 Click the Girl Scouts logo or the chart below to access a full report on the charity’s finances. The Courant’s William Weir reports that new subpoenas have been issued — and more are on the way — in the Department of Public Health’s investigation of a tuberculosis case at the Charter Oak Health Center. The department wants to know when officials first became aware that a frequent patient at the health center suffered from an active case of tuberculosis. The patient, who died last year, could have exposure countless people to the disease, Weir reports. While the public health department roots out conflicting stories on TB case, Charity Check takes a look at the center’s financial health. Click here or the image below to see our full report. That didn’t happen. After a firestorm of criticism, Komen officials reversed the decision last week, and Handel, widely seen as the driving force behind the initial impetus to cut Planned Parenthood off, stepped down. Komen’s annual giving to Planned Parenthood totaled about $680,000, a tiny fraction of the foundation’s budget. So how much financial power does Komen have? To find out, click here or the image below, for the full report in our latest Charity Check. 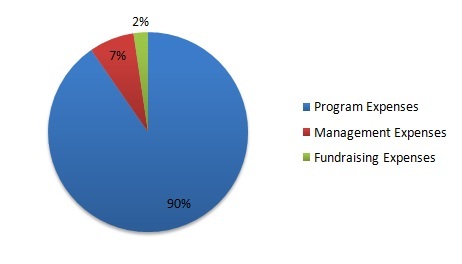 Note: The Scoop’s calculation of fundraising expenses often differs from a charity’s calculation. IRS rules allow non-profits to treat part of the cost of a fundraising appeal as a program expense if the appeal also includes a programming function, such as educating the public. In The Scoop’s calculation, all of the expenses associated with fundraising appeals are counted as fundraising expenses.